Kim BellardIf you aren't in IT, you may have missed the news that IBM is acquiring Red Hat, a leader in the open source Linux movement, or that, a couple days prior, Microsoft closed on its acquisition of GitHub, a leader in open source software development. Earlier this year Salesforce acquired Mulesoft, and Cloudera and Hortonworks merged; all were other open source leaders. I must confess, I had never heard of some of these companies, but I'm starting to believe what MarketWatch said following the IBM announcement: "open source has truly arrived." What exactly that means, especially for healthcare, I'm not sure, but it's worth exploring. IBM is paying $34b for Red Hat. Their offer is a 60% premium for Red Hat's stock, and the acquisition is IBM's largest ever -- and the third largest in U.S. tech history. Red Hat is a leader in Linux, an open source operating system, and has been around since 1993. Linux has become a preferred operating system for cloud computing, for which IBM has big ambitions but in which it trails competitors like Amazon, Microsoft, and Google. Red Hat has many healthcare clients, including Cerner, and IBM had already made healthcare one of their key priorities. IBM sees the future of cloud computing as a "hybrid" approach, in which they help companies use both in-house cloud platforms they control and outsourced cloud platforms. Paul Cormier, Red Hat's president for product and technology asserts: "For most corporations, hybrid cloud is the only practical way to the cloud." Culture may be an issue. Red Hat has what the Wall Street Journal described as a "more freewheeling corporate culture." It quotes one employee: "There's still a very passionate core at Red Hat who really believe in the open-source mission." IBM's CEO, of course, vows to keep Red Hat's culture. GitHub is a repository for open source efforts, hosting code, documentation, and even whole projects. At the time of the acquisition, it claimed to have 28 million developers, with 85 million repositories. HIT Infrastructure noted that GitHub has many healthcare users, citing the source code for healthcare.gov and open source code for Epic and Cerner. Microsoft historically was seen as opposed to open source, including Linux, but CEO Satya Nadella continues to push their culture, and it had, in fact, been a major user of GitHub (as are, for example, Apple, Facebook, and Google). Rather than the deal scaring developers away, GitHub now says they have 31 million developers. Their now-former CEO emphasizes that GitHub will operate independently and keep its product philosophy, while its new CEO says: "Our goal is to help GitHub be better at being GitHub, and if anything, to help Microsoft be a little more like GitHub." With this being a validation of open-source software, this might make any number of companies based heavily or centrally on open source more attractive, or faceless trepidation from businesses spending money on open-source. In other words, expect more open source deals -- and more open source generally. As Red Hat's Paul Cormier proclaimed: "Today is a banner day for open source. The largest software transaction in history and it's an open source company. Let that sink in for a minute. We just made history." Phil Fershy, founder and CEO of HfS Research, agrees: "forget about the cloud, this is all about Open Source." It may be open source's time. For example, Joseph Jacks founded OSS Capital to focus specifically on funding open source efforts. In an interview with SiliconANGLE, he asserted: "We believe that open-source software will always generate or create orders of magnitude more value than any constituent can capture." OSSC's motto is "open source software eats everything." Let that sink in for a minute, or two. People don't often think of healthcare when they think about open source. They more often complain about silos, lack of interoperability, homegrown solutions or one-size-fits-all solutions from huge HIT companies. "Open source" sounds to many healthcare executives like something hippies might do, not HIPAA-responsible firms. Perhaps that is changing. One recent survey found that healthcare, for example, found that healthcare was further along than most industries in moving to the cloud, with 31% of respondents storing more than 50% of their data and infrastructure in the cloud. 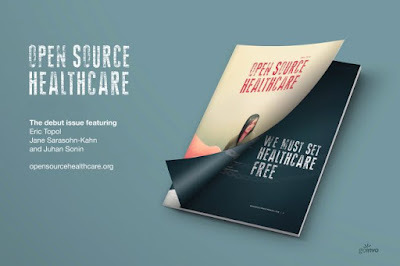 We now have an Open Source Healthcare Journal, in whose debut issue Eric Topol, M.D., noted: "Open source is fundamental. The fact that we don't have open healthcare reflects the deepness of our problem." When computer systems are closed or siloed, when data aren't transparent, or when people can't access the information they need in real time, then those folks can't make fully informed, rational decisions. In health and healthcare, that's tantamount to keeping medicine from sick people -- because in today's data-fueled environment, information is power in the hands of people, patients, consumers, and caregivers. The journal is backed by healthcare design studio GoInvo, whose Juhan Sonin said: "GoInvo is designing the future of healthcare, and we think that future is open." We demand that our healthcare services be open to inspect and correct bias, and to be accessible for rapid innovation and evolution. Together with leaders and progressive thinkers in digital health, we are beginning a dialogue about open source in healthcare. We need to put a fine point on a mission-critical part of our healthcare system, that is dominated by closed services, limited access, lack of transparency into pricing, and no patient-data ownership, which impacts all of our health. Healthcare may be making progress, but not enough, and not fast enough. A cynic might look at these recent acquisitions/mergers and say, well, the big corporations have won the war, absorbing the open source movement inside them. An optimist might look at the same and say, the war's not over, but open source is winning the battle, making even Big Blue and Mister Softee adopt to them. Time will tell. Culture will matter. The question is, will healthcare absorb open source, or adapt to it? Open Source Goes Corporate: Can Open Healthcare Be Far Behind? was authored by Kim Bellard and first published in his blog, From a Different Perspective.... It is reprinted by Open Health News with permission from the author. The original post can be found here.